The Clearfield Area School District would like to recognize Mr. Scott Collins, class of 1986. Scott was inducted into the WVU Sports Hall of Fame in 2006. He was given the bronze plaque at that time and it was in the WVU Coliseum until they made the Hall of Fame interactive and used the Gold Gate to recognize all the student athletes. He is the top 1% of all the athletes that are in the Hall of Fame at WVU. 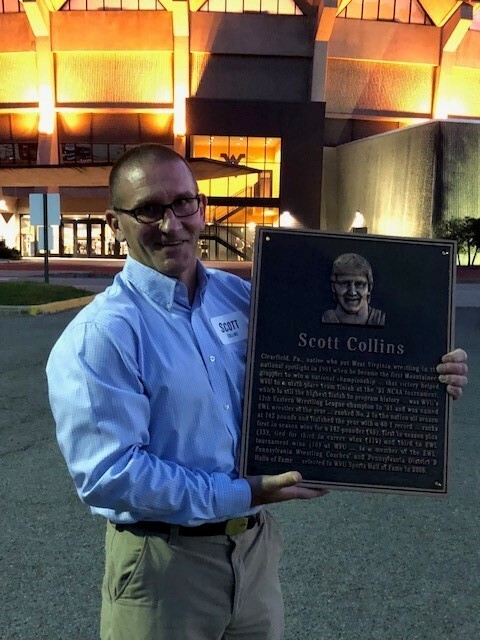 "Scott Collins, a native of Clearfield, Pennsylvania, put West Virginia wrestling in the national spotlight in 1991 when he became the first Mountaineer grappler to win a national championship and guided WVU to a sixth-place team finish at the NCAA tournament, still the highest finish in program history. Collins became WVU's 12th EWL champion when he won that tournament in 1991 and was named EWL wrestler of the year. Ranked No. 1 in the nation all season, Collins dominated the 149-pound weight class as a senior, posting a 40-1 record (undefeated in EWL action) and downing Oklahoma State's Chuck Barbee at the 1991 NWCA All-Star Classic.